Amazingly the main works on this disc were recorded 25 years ago. 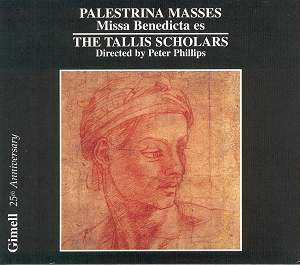 The recording of Palestrina�s Missa Benedicta es along with the accompanying plainchant and motet by Josquin, was one of the first issued by The Tallis Scholars on their Gimell label. The mass was re-issued on CD in 1990 but has now been coupled with another early Palestrina mass, Missa Nasce la gioja mia, to provide a wonderful treat for lovers of Palestrina�s music. Even on the early, 1981 recording, the characteristics that make up a performance by The Tallis Scholars are fully in evidence with lively rhythms, wonderful transparent textures, a lovely sense of line with clear balance between the voices. This clarity is one of the great things about their performances; lines and textures are always beautifully clear and each line is sung with a good attention to shape and detail. Peter Philips directs everything with a great fluidity of tempo. Palestrina�s Missa Benedicta es was for a long time labelled as Missa Sine titulo. The mass was an early work, completed in 1562 and its displaying of Franco-Flemish musical traits has led scholars to realise that Palestrina based the mass on Josquin�s motet Benedicta es. This motet, dating from around 1500, is in turn based on the plainchant sequence Benedicta es. On this disc The Tallis Scholars give us finely turned performances of the plainchant, Josquin�s motet and Palestrina�s substantial mass. Palestrina�s interest in Franco-Flemish models would lead to other things such as the Missa Papae Marcelli, the mass that immediately followed Missa Benedicata es. Missa Papae Marcelli shows many of the Franco-Flemish influences that are apparent in Missa Benedicta es. The performance from The Tallis Scholars is admirable and richly textured. There are moments, such as in the Agnus Dei, when the singers sound a little tired but this never detracts from what is a very fine performance. On this disc the Missa Benedicta es is accompanied by Missa Nasce la gioja mia, which is an early work of Palestrina�s which would exert little influence on his later output. The mass is one of the last that he ever wrote based on a madrigal, in this case one by Primavera. Primavera wrote lightweight three-voiced works to Neapolitan texts. The musical material that Palestrina had to work with was relatively straightforward and rather short-breathed, as such it must have been something of a challenge for the composer, albeit one that he never felt inclined to repeat. Still, the result is charming and fascinating. Palestrina set the mass for SSATTB and gave the tenor parts rather a high tessitura. At times the tenors sound a little too dominant, consequently balance is not always quite what you expect from this group. This is really the only respect in which the recording shows its age. Since these discs were recorded, views on the ideal performance of this style of music have developed and multiplied. The Tallis Scholars� approach, with its sculpted perfection of phrase, avoidance of vibrato and cool perfection, was once seen as the acme of style in this music. But with the development of more native Italian groups performing this repertoire, many groups have been exploring ways of performing Palestrina with the emphasis on intensity and passion. Another aspect of The Tallis Scholars� approach is the presentation of each mass as a found object, with no attempt to re-create its original setting as part of the sung mass. This is a perfectly valid point of view, but when listening to a mass as long as Missa Benedicta es, I often feel that Palestrina�s work would be set off by the inclusion of some contrasting plainchant between the movements. Though other, more intensely passionate styles of performance of Palestrina might appeal, if you want a performance of Missa Benedicta es� then this is your only possible disc and frankly you can�t go wrong with the stylish perfection of The Tallis Scholars.